What do feather boas, pompom shakers, chain links, and tissue paper all have in common? 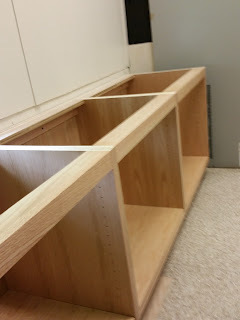 Bulletin boards! That's what! I work with an amazing group of teachers. Not only are they amazing at teaching and working with our sweet kiddos, but they are pretty amazing decorators as well. and this year they have created some of the most colorful and creative bulletin boards for our school hallways! Today, I want to share 4 fabulous 3D bulletin board ideas from our school with you! 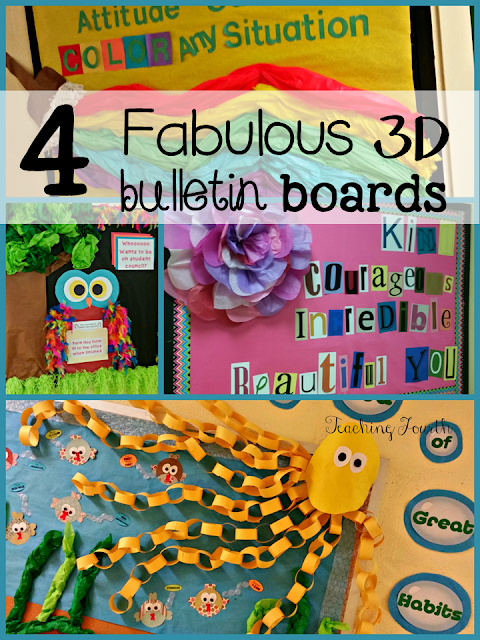 4 Fabulous 3D Bulletin Board Ideas! 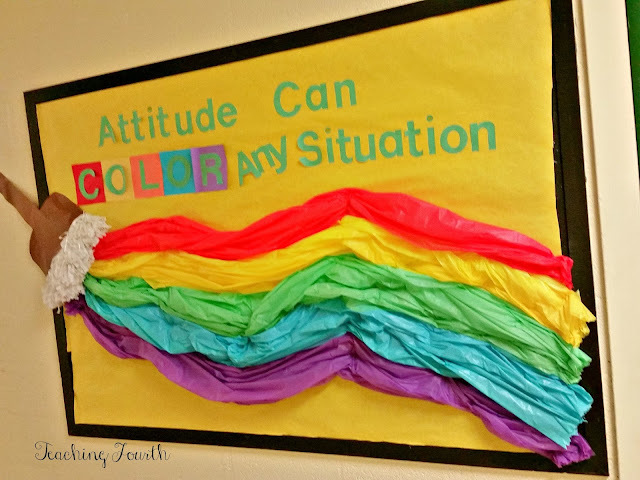 ﻿﻿﻿﻿ Bright, colorful, and creative would be how I would describe each of these bulletin boards, and boy, do they add a splash of color and a POP to our hallways! 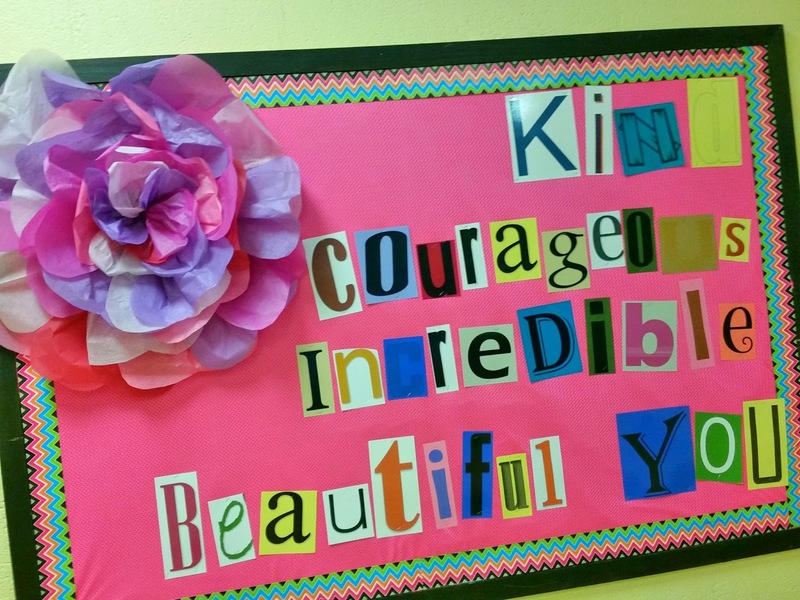 The bright colors and tissue paper flower of this bulletin board definitively make it a stand-out in our hallways! It is absolutely gorgeous! Don't you just love these encouraging words? 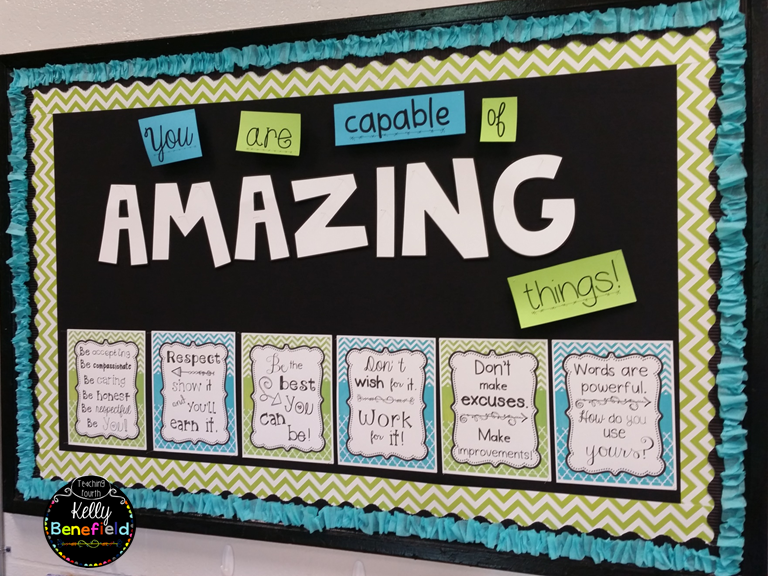 This bulletin board simply makes me smile!! 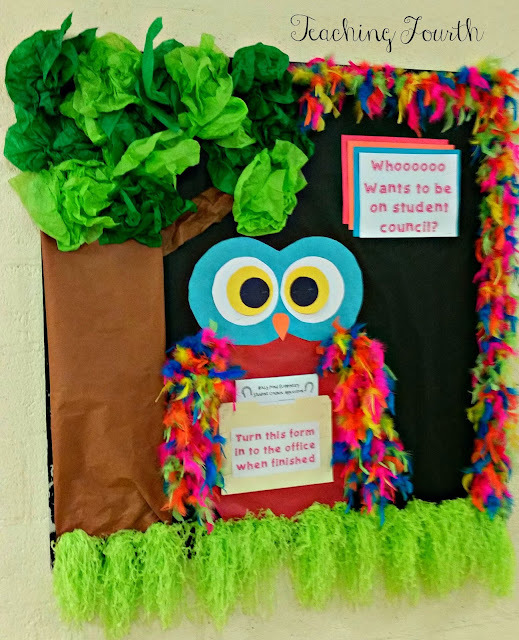 Now, you probably know that I love owls, and when our counselor put up this amazing owl bulletin board, I was so excited! Feather boas, pom-pom shakers, and a tissue paper tree make this bulletin board an absolute show-stopper! 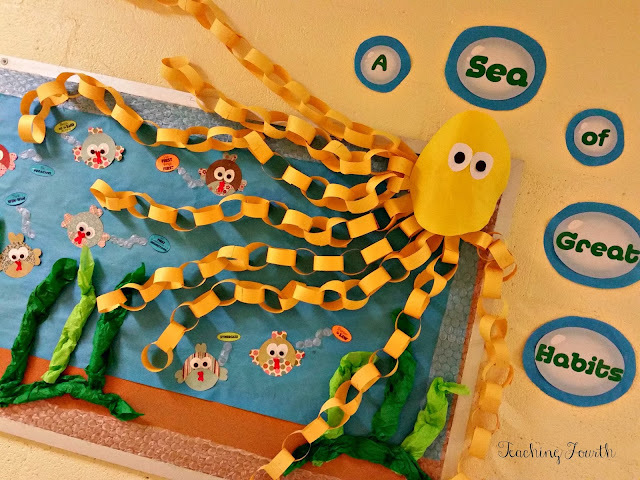 I know that I have seen several versions of this 3D bulletin board floating around Pinterest, but our counselor's version of this paint brush bulletin board is just too cute to not share! Under the sea themed bulletin boards are always cute, but this board is beautiful with all of its 3D effects! The octopus with chain link legs is simply adorable!!! Our hallways are looking good with all of these fabulous bulletin boards in our school! Today's post is short and sweet, but I hope you enjoyed these bulletin board beauties! One of my most visited blog post is Favorite Read Alouds for the First Week of School. In this blog post, I listed several picture books that I love to read during the first week. 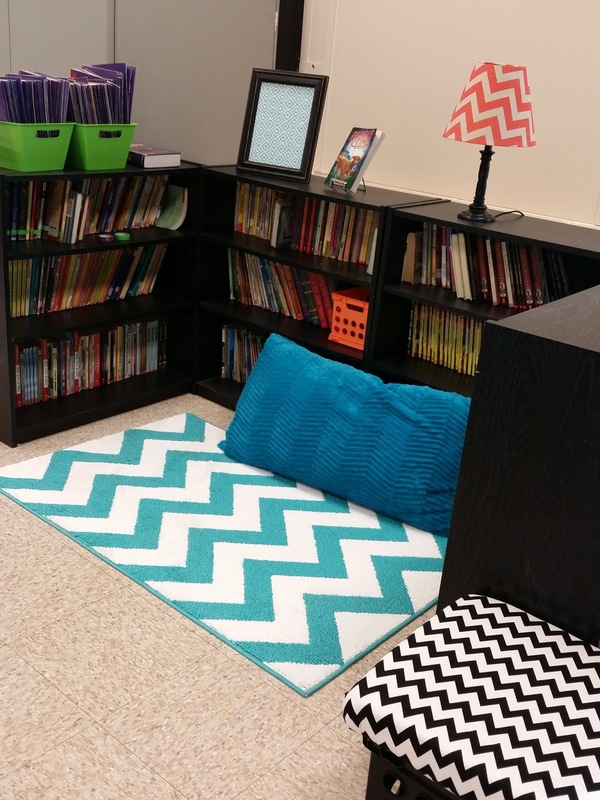 This list includes a few different titles that are usually not listed for the beginning of school. 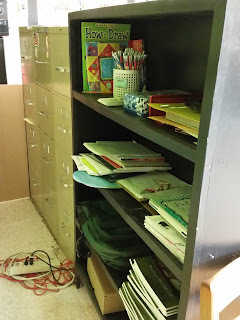 I did not, however, list one of my favorite back to school books in this post. This year, I went back to that old favorite, Chrysanthemum! I love reading this book to my students partly because of the overwhelming response students have to the story. I'm always surprised by how many fourth graders are not familiar with this book. This year, after reading the Chrysanthemum, I helped demonstrate how to draw a simple picture of the main character. 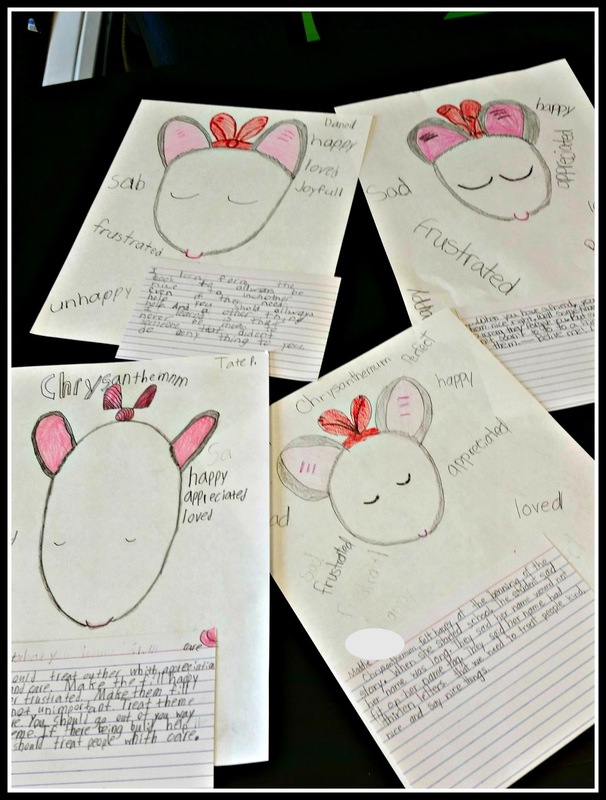 Then on the left side of the paper, the students wrote words to describe how the students' cruel words made Chrysanthemum feel. On the right side, they wrote how Chrysanthemum's parents and Mrs. Twinkle's kind words made her feel. Next, on an index card, I had the students to write what they learned from the story about how to treat others. 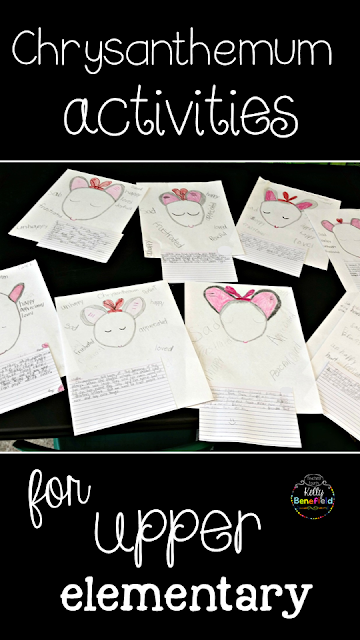 Not only did the students' pictures turn out adorable, but I knew from the paragraphs that were written, that the class understood the message in the book. This helped to reinforce the ideas of classroom community that we have been establishing the first week of school. These adorable drawings and writings made a perfect hall display for back to school! Well, we all not only survived, but I truthfully fully enjoyed my first week of school. Our school district begins school on a Wednesday, which is fabulous. This way teachers can establish routines and have time to get to know the students. When next week comes, everyone is ready to dive in and begin a full week. 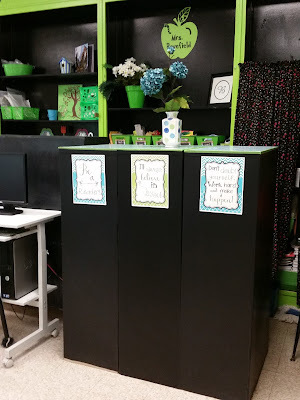 The student chairs in our classrooms are green, and I painted my bookshelf wall bright green a few years ago, so naturally, green is part of my classroom color scheme. I personally like the look of turquoise blue with the green, so that is what I chose as our classroom color scheme. 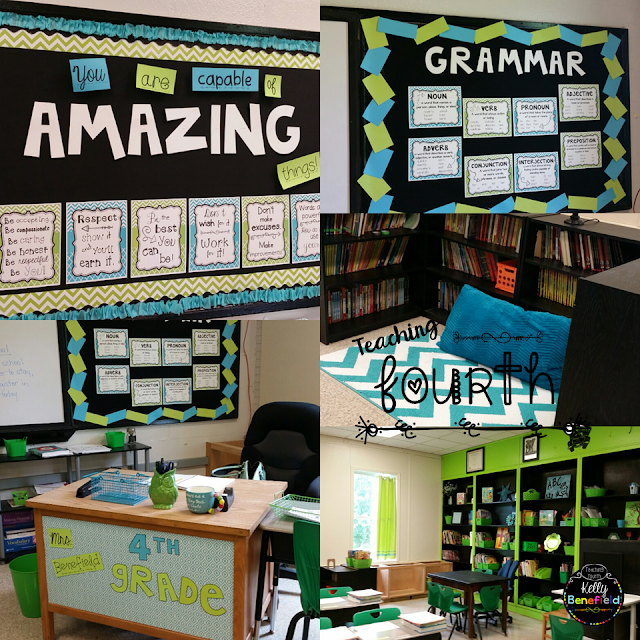 The bulletin boards are functional as well as pretty. Motivational posters are hung on one classroom bulletin board. This bulletin board and title were inspired by this bulletin board by Amy Lemons. You can purchase the motivational posters here in my store. 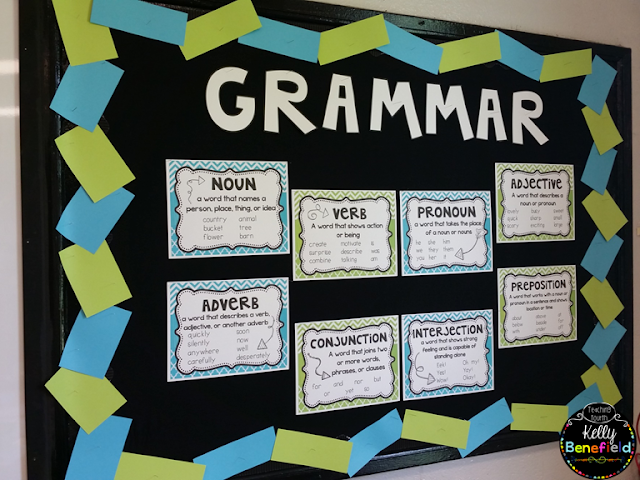 Grammar parts of speech posters are hung on the second bulletin board. 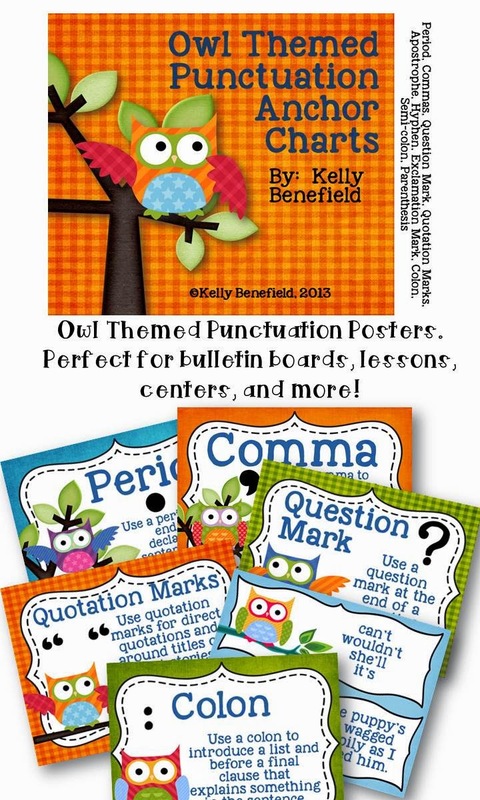 Purchase my Grammar Parts of Speech Posters here. The front of the desk is covered in a pretty blue contact paper. Simple cut out letters decorate the front. Blue contact paper lines the front of the desk. Contact paper covers old filing cabinets. Two final picture lets you know why I say that my classroom is not perfect.This summer, our old classrooms have undergone some renovation. The wall of old rusty windows have been replaced with a wall and two nice new windows. I love it! Now, my room will stay cool in the summer and warm in the winter! No more cold air blowing through the cracks in my window panes. We also are getting a wall of new shelves, but unfortunately, they are still working on these, so for now, I do not have countertops. 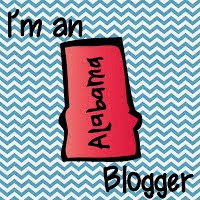 This is what I have, but, hey, I'm happy to be getting countertops soon, and I simply decorated around them! 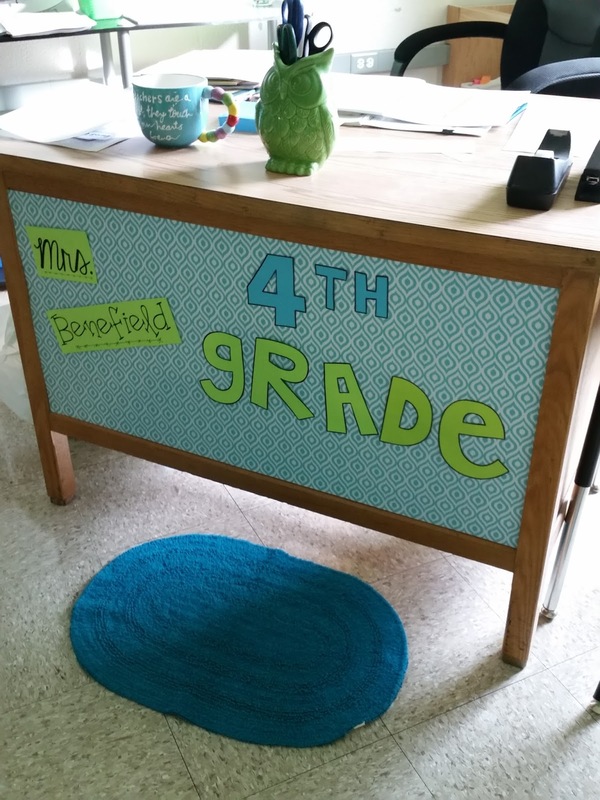 I'm just so excited to be getting these in my classroom! 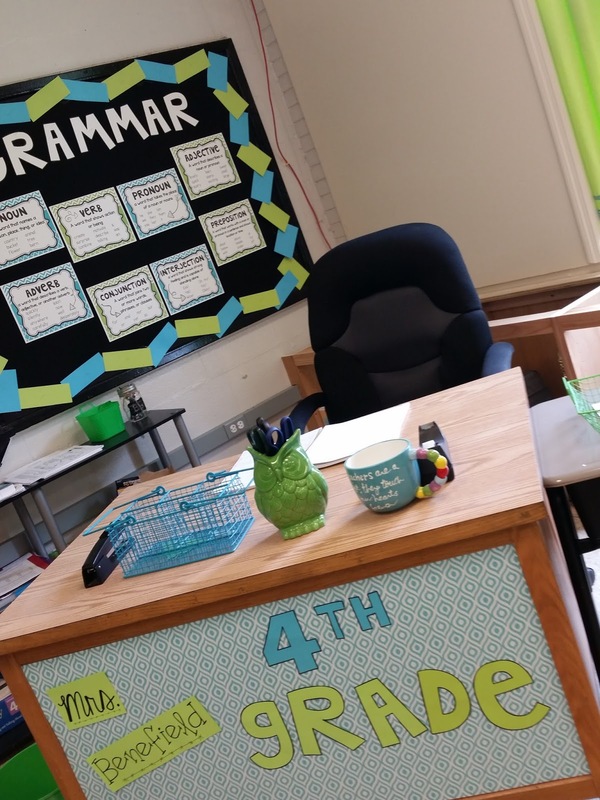 I am beginning a new series here on Teaching Fourth called "4 Fabs with Teaching Fourth." This series will highlight a variety of subjects, thoughts, strategies, and more for your classroom and school year. 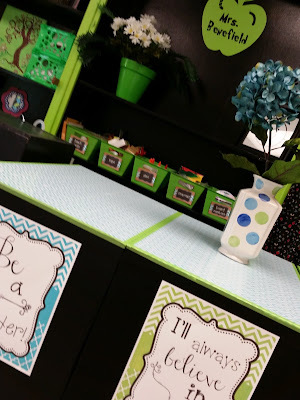 With the beginning of school starting or approaching for many of you, I am kicking off this series today with, "4 Fabulous Thoughts to Instill in Your Class Beginning the First Day of School." We as teachers have the opportunity to touch so many young lives each and every day! Knowing this, here are four fabulous thoughts that we can instill in our students each and everyday beginning the first day of school. Others are Important. Treat them with Respect. While we want each child to feel special and important, we want to teach our children to always treat others with respect and in a way that will make others always feel important. As we model how to treat others with respect, our students will have the opportunity to see this in action. Also, provide opportunities for student to make others feel important and show respect. In one classroom recently was an autistic child, who just three years earlier could not speak. This child was new to the school, so (while this child was not in the classroom) the teacher explained to the other children that this student would be learning differently and would need help with finding the classroom his way around, his supplies and materials, remembering items when exchanging classes, and help in the lunchroom, etc. Well, this amazing group of students knew the importance of making everyone feel important, and they went above and beyond! Not only did they help this sweet child each an everyday, they celebrated and applauded later in the year the first time he answered a question in a class discussion correctly! They applauded and celebrated his accomplishments when he was able to participate in a Smartboard activity, and they made his mother cry when they applauded and celebrated him receiving an award at an assembly....There were too many celebrations to list. Sometimes teachers learn from students, too, how to make each and every person feel important! From day #1 students need to know that we believe they can do everything that we ask them to do. We believe in them as a student and as a person. Your precious students may not hear this at home. We as teachers may be the only people this year encouraging and believing in a child. 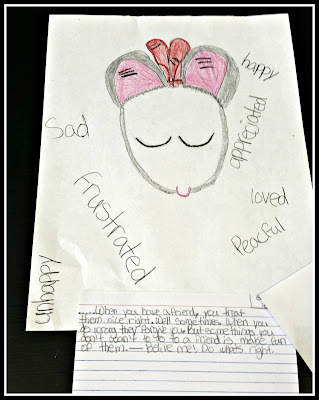 What a difference we can make in this child's life. I firmly believe God has placed each and every child in my classroom for a reason. No matter how gifted, how chatty, or how challenging a child may be, there is a purpose for that child being in my classroom. I want to reach each and every child and help each and every child reach his/her potential because I believe in each child! 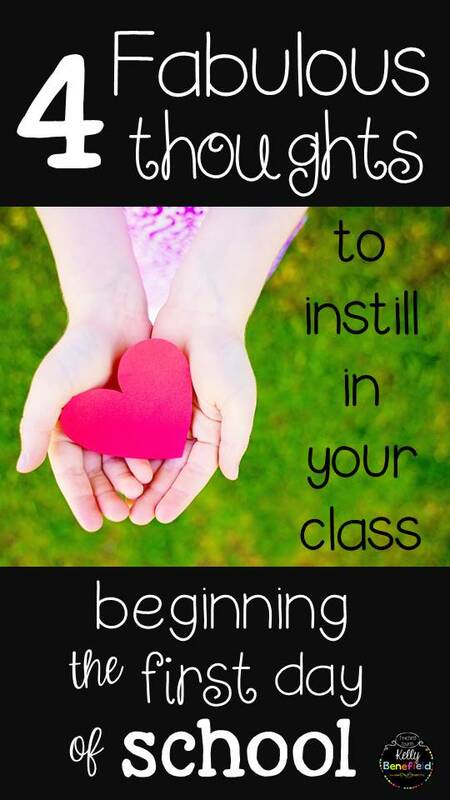 By instilling these 4 thoughts in your students beginning the first day and every day throughout the school year, we are helping our students to grow and develop good character that will benefit them not only this school year, but for a lifetime.